Jeffery Ivy: Texas boy goes off to seek his winemaking fortune in California, and returns to make a difference in Texas wine. Now, this is the kinda story I like very much. Having started his career as a retailer in Austin, he soon found that the retailing biz was less than rewarding, and so began harvesting and cellar work for the likes of Slaughter-Leftwich, Gregory Graziano (Domaine St. Gregory) and Quivera and even tucked in a bit of distillation experience at Germain-Robin, makers of "some of the best brandy on the planet, bar none" in Mendocino County. Finally making his way to head winemaker over a course of a decade (Roshambo Winery, Healdsburg), he felt the tug to bring his winemaking skills home. 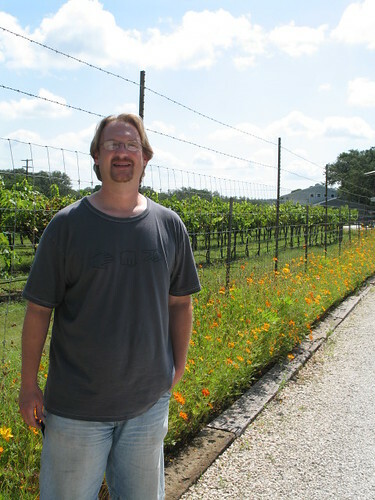 Jeff is the new winemaker for Dry Comal Creek winery, a small but very cute winery way out in the Western Hill Country near San Antonio. Dry Comal Creek is famous for their eye-catching labels and for a previous vintage of a dry style wine from Black Spanish, or Lenoir grapes. The former recognition is a positive one; the latter is not. Said Black Spanish wine is very, very bad. Other wines they make are pretty good. They're just not Texas wines. 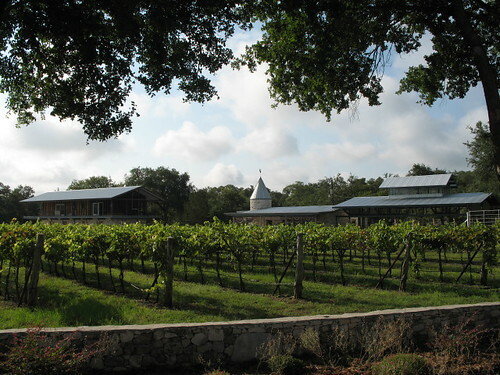 Because of the difficulty in finding good grapes in this part of the Hill Country, many small outfits like Dry Comal Creek source their fruit from outside the state. Texas is not the only state who does this, not by a longshot. But all the same, I think it is a consumer's right to know this. Jeff is working not only to improve that poorly made Black Spanish, but to use his knowledge to make the Dry Comal Creek line a distinctive one. One of the ways Jeff has correct the Black Spanish issue is to make a rose from it, a cool blended summer wine that is perfectly nice. That's what happens when you have a good, experienced winemaker who can turn around trouble. Take note, people. C & D: Take me back to what it was like to come back to Texas after your California adventures. What did you find here? Jeff: I had always thought when I moved to California that someday I would come back. I didn't think I would have the capital to buy property or start a brand in California. Someone like me who wants to have a little place, grow a few acres of grapes and make a little bit of wine, it's just not feasible unless you have a whole lot of money to start out with. So Texas was a better situation because my family owns land here already. When I talked to my friends here that were still in the business, it seemed like there was a renaissance going on here...(Texas) went from forty wineries to over a hundred in less than ten years. That told me two things: one, that there were people with money who were willing to start things, and two, that they might need a professional winemaker. I think the thing that cemented it for me was that I was here in November of '05 for the New World Wine and Food Festival in San Antonio and shared a winemaker dinner with Kim McPherson and tasted his viognier and his rose and I was like, well, if these wines can be made in Texas, then I'm on board. 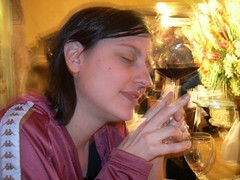 They were very good wines, and I'm not even talking just solid or clean, they were very good, they were distinctive. Some of the wines from Jim Johnson...I'm like, this can be done here. There's just another level of dedication that has to be here. You don't have the quality of your base resource like you do in California. People might disagree with me, but it's pretty easy to make wine in California because you have an abundance of really good grapes. Whereas in Texas, if you're trying to make wine from Texas grapes you don't always have the luxury of quality fruit. So what sort of thing do you have to do to compensate for that in the winemaking process? A lot of years, because of the weather, you're not going to get the grapes as ripe as you'd like them. Sometimes you have to bump the sugar up to get the alcohol you want. Tropical rainstorms that come off the Gulf...it rains for two weeks straight, and your grapes are stuck at 18 brix and going nowhere. Sometimes it's so hot that they shut down for the season. You either pick them or you're left with raisins. Especially in the Hill Country. Maybe that's not such an issue in the High Plains, I don't know. With reds in Texas you have to deal with the fact that you have a much shorter growing season, and with vinifera you don't have the development of tannins and...not a lot of color to work with. You have to augment that. The point I'm trying to make is that here you have to be prepared to augment to make the wine you want to make. Tell me what you walked into, coming into Dry Comal Creek. Well, the winery was a bit of a mess. There were wines in tank that had not been managed, at all. They were contaminated with bret, that had to be dealt with. I also had to clean barrels that hadn't been maintained. And I knew that was what I was walking into, that the winery had been neglected by the previous winemaker, and that was one of my first jobs, was to clean the place up. But I've seen worse in California, it's not exclusive to Texas. One of the things I had to do was to start developing sanitation protocols, things that get done regularly, all the time. Currently, the majority of the wine you make comes from fruit sourced from California and other states. What dictates where you get these grapes? In the past, it has been price. I know that, for example, the sauvignon blanc and the chardonnay come from Temecula, that was a contact that was brought to us by a consulting winemaker, Dr. Enrique Ferro. I still use him...he's a nice resource to have because he's a great chemist and I'm not a chemist. Now those come to you as juice, correct? Yes. Or in some instances, it comes as finished wine. The sauvignon blanc comes as finished wine. The colombard comes as juice, which is good because...one, it's unique and no one does it, and two because it's readily available, and Franklin has a good relationship with California Concentrate who processes the juice for us. If suddenly all your dreams came true, in terms of available resources, what you could get your hands on, and what you could do, what would that look like? Now by here, do you mean the Hill Country? I'm talking about the Northern Hill Country, San Saba County, because that's where my family has land. I've always had this idea that I'd have a ranch. And not just about grapes, you know, I'd have peach trees or pecan trees...just have a farm. And it wouldn't necessarily have to be huge...I'm not in this business to get rich. That's not why I do it. I do it because I love to make wine. Texas Wine Question O' The Day: Why should I call wine made from California or New Mexican grapes Texas wine? Let me know. Next up: I drink Texas wine and tell you what I think. 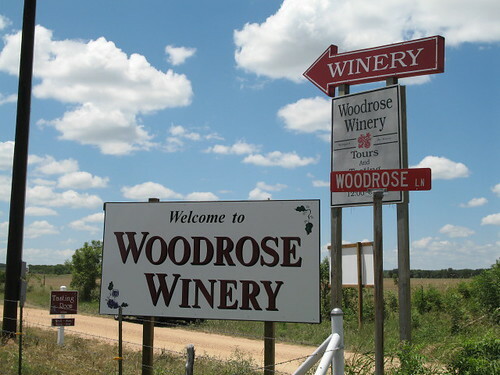 Woodrose is out in Stonewall, Texas on the Enchanted Trail, quite close to the larger Becker Vineyards spread and in a very strategic place indeed. Mike Guilete, who bought the winery and its vineyards last year, plans to make it a destination rather than a casual stop just for a sip of chenin blanc. By 2008, the Guiletes plan to expand the property into a "full running resort", complete with stone walkways around a fountain, a 3,000-square foot deck around the tasting room, and a Bed and Breakfast. The tasting room is set up restaurant-style, so there's no struggling against a mob at the bar trying to get a pourer's attention. Cork and Demon: Tell me what you do now and how you got started with Woodrose. Mike: Predominantly I make computer chips for a living, but I've been fascinated by wineries and the wine business for a long time, so last year, I bought Woodrose Winery. Brian Wilgus was the previous owner and did a really good job of creating a small vineyard, small winery, and I feel like a lot of my charter is to expand on his vision: finish out the vineyard, add additional tanks, and just try to produce a nice, medium quality wine at a reasonable price that people can come in and just enjoy. What do you have in the vineyard now? At this point I grow cabernet, merlot and sauvignon blanc, and then I purchase a lot of grapes from other vineyards...I brought in chenin blanc last year and some merlot so I can get a more diverse line, and I brought in some additional cabernet so I could make a rose. Talk about where you see your winery in the Texas market. My goal is to make...a medium quality wine. It's a weird way to define it...I want a really high quality wine, but an approachable wine. So I want a wine that people can walk in and aren't that knowledgeable and can enjoy a decent cab or merlot that's not overwhelming in complexity and flavor. What do you think is so intimidating about wine to the people who visit you? First and foremost, I think they're intimidated by the process. They feel like they're overwhelmed by the number of choices and the ritual of how you pick a wine. And I think, when you spend a little time and explain to them the reasons you taste things the way you do, to try to pick up some of the aromas and accentuate the flavors, a lot of people find that it's not that intimidating. Why did you set up shop here in Texas? Why not California or Oregon? There's two parts to that. As I started researching and learning about it, I thought there was a lot more opportunity to grow with the Texas market than there was with California or Oregon or Washington. I think the expectation out there is you buy a winery and do your best not to mess it up. They've got the experience, they've got the knowledge. I think there's a chance to learn along with the Texas wine industry. The other part is, if you look around, Texas has a lot longer of a history with wine than most people understand. We were growing grapes long before California, yet we've lost all of that. When you read the history you realize there is a lot of potential to really make good wine. Part of our problem is we lost that heritage, and then we try to copy California's style. So over time I think we have to learn how to create our Texas style of wine. What are some of the challenges the Hill Country faces, both with growing grapes and making wine? First, we have elements of nature that are kind of against us. Pierce's disease, the most notable, you run the risk of losing your entire vineyard. On top of that our weather: we tend to get big swings of cold at the beginning of the season and a lot of changes in water and heat. So we have more variation in the grape itself than you would see in a California wine, vintage to vintage, and that's something we have to take into account. The other thing that I see is a struggle balancing the wines that sell to people that are new to wine versus those who have been around for a long time, and are looking for a fine wine to appreciate. So it's hard for me to define a style I want to have in terms of winemaking and where I want to take it. What style of wine do you like? I tend to like a full-bodied cabernet, something with a fair amount of complexity, I like a little oak in it. I like it when the next day, you can remember the flavor. It doesn't have to be a lot of weird complexity or spices, I'm not looking for different fruit flavors, I just want something that really triggers a response. Where do you see yourself as a winemaker in five years? Where I'd like to see myself in five years is having a reputation as a winemaker who consistently makes approachable, drinkable wines. The kind that people would be comfortable recommending to their friends. It's going to be something that from year to year is consistent and from bottle to bottle, you know what to expect and what you get. The bottle 'La Cigale', a lovely blend of tempranillo, grenache and mourvedre, bears the name Woodrose Winery, but I learned that this was not Mike's wine. Made by a woman named Benedict Rhyne, the remaining stock of it was bought along with the property. I also learned that it may have been blended with a finished wine to boost color. Now, that's not my favorite thing to hear, but it beats the hell out of Mega Purple. Be sure to stop by and comment. This trek into Texas is about discussion, people. So discuss. A real quickie before I get to my interviews: a comment was posted which tells the people what they need to know, so check it out, Texas. There are more Texas wineries selling out of state fruit than we could mention here. Some are perfectly open about it, labeling the wine as "American", rather than Texas, some don't label it with an appellation at all, some are much more dishonest. And Texas law allows for the dishonesty. Under FEDERAL wine labeling law, if the wine is labeled as Texas, at least 75% of the fruit had to come from Texas. Texas law is not so demanding, allowing a much lower percentage of native fruit, and then allowing the wine to be marked "For Sale in Texas Only" to keep the label from triggereing federal law. It's a pretty dirt little trick. Furthermore, some Texas wineries use their brand identification to simply bottle wines without telling you anything about fruit origin. 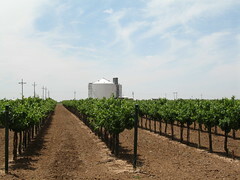 The current Llano Pinot Grigio has NO appellation listed. Wanna bet it's not from Texas? Customers should ABSOLUTELY be able to assume that wine from a Texas winery is actually FROM TEXAS. Unfortunately, both Texas and Federal labeling law provide many loopholes to fool the customer. Same thing with a "California" wine, the 2004 Mark West Pinot Noir was cleverly from Corsica, that's Corsica, France. Said it right there on the front label, on the shelf, in the California Pinot Noir section. But because people thought of Mark West as a California brand, most people never thought to check whether the wine was actually from California. Just read the labels folks. If it's from Texas it will say Texas, or Texas Hill Country, or Texas High Plains, or Lubbock County, or some identifiable geographical Lone Star locale. BUT, If it says "For Sale in Texas Only", all bets are off. It's undocumented alien wine, might be from Mars. The topic of Texas wine has inspired a lot of thought and a lively conversation in the comments for the previous post, and since there is much to discuss, I'd like to clarify my own goal in this segment. As one reader said, if you look at the overall business picture---percentages, per capita production, trade magazine and wine competition feedback---you might get the idea that Texas wine is doing just fine. From many angles, it is. As I said, we're the fifth largest producing state. That's nothing to sneeze at. But every very one of the other states in the top five seems to have every healthy tier of wine being produced. There is the inexpensive stuff, like Gallo; then the tourist circuit, semi-sweet wine; the nationally distributed wine of various price points, and then finally, the high quality, distinctive wine (which is still probably overpriced, but what're ya gonna do). Currently, Texas has produces a mazillion gallons of the first, pallets-full of the second, but none of the third and so precious little of the last that it makes me weep into my Lone Star Longneck. My angle is this: I would like to see Texas distinguish itself in the national market in that last category in particular, and to do so consistently. Furthermore, and here's the kicker: I want ALL the fruit for these wines to come from Texas, and bear the distinct mark of appellation. As I go out and talk to current winemakers, I am trying to ask questions around this little personal fantasy of mine, to see where their heads are and what role they want to play in the Texas market. The wineries around me are part of what is called the 'Enchanted Trail', which is in the Western part of the Hill Country. It is a tourist circuit, and the wines are mostly geared towards that market, which craves semi-sweet wine and lots of cute doo-dads for sale in the tasting room. Some of these wines are quite nice. I've sipped many a tasty, aromatic orange muscat on a hot summer day. And occassionally, a relatively dry red wine will come out of the pack, but not often or consistently. The challenges to vineyards grown in this area are so daunting, however, that there are few acres that escape it, and the majority of these wineries source their fruit from wherever they can get it: California bulk, New Mexico, Arizona. Pierce's disease, a bacteria spread by sharpshooters that slowly destroys vines over a period of one to three years, is a vicious culprit, and unfortunately, this part of the Hill Country is Sharpshooter Central. It is almost inevitable that vineyards around here suffer and are often completely destroyed by this blight. Other diseases and fungus such as bunch rot are also a problem. Weather's another enemy sometimes. Long, hot summers can shut vines down, and frequent rain spells from the gulf halt sugar levels before harvest. In sum, grape Shangri-La, it ain't. But there are AVAs in Texas that are more appropriate for vitis vinifera: the Texas High Plains and the Davis Mountains. The fruit from the High Plains around Lubbock is consistently good. There's just not enough of it to go around. What the Enchanted Trail does have, though, is tourist pull. Apart from wineries, there are scads of peach and produce stands. Johnson City, home of LBJ, has a state historical park on his homestead. The area is a favorite with bikers with the famous beer and live music venue "town" of Lukenbach as well as a couple of other biker-friendly stops. Finally, Highway 290 takes you to Fredericksberg, a crowded but quaint shopping destination for the family. So I'm thinking this: High Plains fruit + Hill Country Charm = opportunity to make kickass wine and get it out there. This, obviously, would require lots of things to happen. More growers, more money, more marketing, and some more money. And also a lot of money. Does anyone have twenty million bucks I can borrow? Up next: Mike Guilete of Woodrose Winery, and Jeffery Ivy of Dry Comal Creek talk more about the challenges of the Hill Country. First, the trivia: Texas is the fifth largest producer of wine grapes after California, New York, Washington and Oregon. She has a vinicultural history that predates California's by roughly a century, and still has one winery that has been in consistent production (yeah, during Prohibition, too) for the entire time. Current vineyard acreage is around 3700, there are over a hundred wineries in operation, and over a million gallons of vino is produced every year, contributing almost two million dollars to the agricultural economy of the state. By all accounts, we should be big. Just like New York, Washington or Oregon, we should be a travel destination for wine lovers the nation over, producing top-quality, well recognized bottles that get praise galore from reviewers across the globe. If you're snickering right now, you just hush. So what's the problem? Or rather, the problems? Why is it that Texas wine still holds a reputation for low-end amateur tourist wine among enthusiasts? Why, despite countless "awards" and "medals", does Texas command no presence in the national market? Why is it one vintage of so-and-so's Cabernet is so great one year, and absolute swill the next? And most of all among this set of Qs: why is it that when a particularly good Texas wine is released and receives recognition, does the price tag on the bottle make me want to spew my smoothie in laughter? For the next several posts, I'm going out into the field to talk to Texas growers, winemakers and investors to try to find out what needs to happen to get Texas on the wine map of the world. I want to ask difficult questions, and I want good, solid answers. I want to know exactly where the Texas market is right now, why, and what the people involved believe it's gonna take to improve the quality, marketability and reputation of Texas wine. Next week, I'm interviewing Mike Guilete, the winemaker for Woodrose Winery. They make 'La Cigale', that wine I was so nuts about when I tried it during my trip to Lubbock. What I'd LOVE from you, gentle reader, is to lay some of your opinions about Texas wine on me. Especially if you're from a different state. What have you heard about it? Have you ever tried any, and what did you think? I want to know if what I think is happening, is happening. So leave me a comment and tell me what you think of when you think 'Texas Wine'...honestly. Don't worry, I won't be hurt. I got an email from a reader asking my opinion about terroir vs. appellation, and it was getting to be such a long email, I just decided to make it a post. To be honest with you, the terroir vs. appellation arguement is a big fat word-mincing party as far as I'm concerned. Terroir is a French word which doesn't fully translate into English, but basically means all of the agricultural elements that are in play in any given specific vineyard or area, including the makeup of the soil and the microclimate. Appellation is a specific place on a map where there are such specific elements in play. Blah, blah, blah. It's like this organic farmer I met recently who insisted that he was by no means a "enviornmentalist" (dirty word) but rather a "conservationist" (acceptible term). WTF ever. And after all that, how the wine is marketed to you. Don't laugh. People love themselves some critters. And for many, if there's a critter on the label (kangaroo, emu, penguin, eagle, bear, dog, rhinocerous, cherub, lobster, or what have you) it tastes better. But don't get me wrong. The word terroir is under fire these days for both good and bad reasons. The good: it is, in fact, used ad nauseum to glorify many an ad campaign here in America, and has been used for centuries in Europe to create an expectation of quality regardless of all these other factors that could have gone wrong. The bad reason: terroir, if you'll indulge the word, encompases some of the most important variables in the flavor of complex and interesting wine. 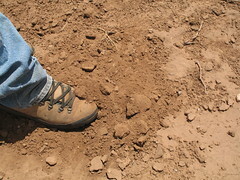 There is no doubt that soil composition, for instance, has an effect on the flavor and longevity of wine. BUT... this is contingent upon whether or not the winemaker has chosen to allow those secondary flavors to remain. 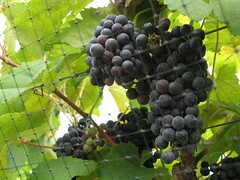 Many fruit forward style wines have so much big fruit at the front of the palate that it is very difficult to find terroir-influenced flavors. That is a style choice that both the winemaker and the grower can make if they wish. So for me, terroir vs. appellation = who cares. When boiled down to their most honest meanings, they are both very important, and one does not occur without the other. I hereby replace both words with the neologism plantiness. Just in: a wiki site for your perusal: Encyclowine. Express your deep geek need to tell the world the facts by writing for or editing posts. This site was put together by a fellow Austinite, so I just gotsta spread the news. Check 'er out! I've been thinking about what to do next. There must be more to blogging than review after review, or biz talk, which bores the crap out of me...and then it hit me. I have yet to cover the very wine country on my own back porch. Well, that just won't do. So next up, I'll hit my local people. "Aw, but who gives a crapola about Texas wine?" I do. The Texas wine industry is a great conundrum. We have some great areas for growing, but still the industry flails. Why why why??? I wanna know. Why do many Texas wines come out so thin and flawed? Why don't more winemakers grow varieties that would do better in the heat? What's it going to take to make the Texas Wine Industry flourish? Money? Talent? A change in the dry county laws? Well, I'll do my best to find out. Stay tuned.